Add-ons are a source of new or updated Warehouse Views, Charting Views, Filters, Combo Ranks (FVC). 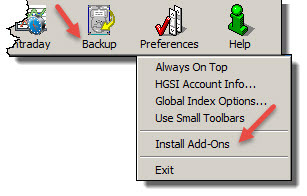 Cautions: Add-ons to the HGSI software are always “installed” using the “Install Add-ons” command shown above. Do not open the zip file and use the HGSI “Import” command. Add-ons overwrite files. If you have customized the settings of any of the previous installed add-on filters, chart views, warehouse views or combo ranks and DID NOT CHANGE the file name it will be overwritten and your changes will be lost.